"Rivers" redirects here. For other uses, see Rivers (disambiguation). Rivers are part of the hydrological cycle; water generally collects in a river from precipitation through a drainage basin from surface runoff and other sources such as groundwater recharge, springs, and the release of stored water in natural ice and snowpacks (e.g., from glaciers). Potamology is the scientific study of rivers, while limnology is the study of inland waters in general. 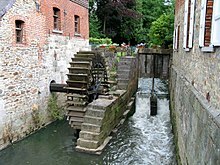 Most of the major cities of the world are situated on the banks of rivers, as they are, or were, used as a source of water, for obtaining food, for transport, as borders, as a defensive measure, as a source of hydropower to drive machinery, for bathing, and as a means of disposing of waste. The river channel typically contains a single stream of water, but some rivers flow as several interconnecting streams of water, producing a braided river. Extensive braided rivers are now found in only a few regions worldwide, such as the South Island of New Zealand. They also occur on peneplains and some of the larger river deltas. Anastamosing rivers are similar to braided rivers and are quite rare. They have multiple sinuous channels carrying large volumes of sediment. There are rare cases of river bifurcation in which a river divides and the resultant flows ending in different seas. An example is the bifurcation of Nerodime River in Kosovo. A river flowing in its channel is a source of energy which acts on the river channel to change its shape and form. In 1757, the German hydrologist Albert Brahms empirically observed that the submerged weight of objects that may be carried away by a river is proportional to the sixth power of the river flow speed. This formulation is also sometimes called Airy's law. Thus, if the speed of flow is doubled, the flow would dislodge objects with 64 times as much submerged weight. In mountainous torrential zones this can be seen as erosion channels through hard rocks and the creation of sands and gravels from the destruction of larger rocks. A river valley that was created from a U-shaped glaciated valley, can often easily be identified by the V-shaped channel that it has carved. In the middle reaches where a river flows over flatter land, meanders may form through erosion of the river banks and deposition on the inside of bends. Sometimes the river will cut off a loop, shortening the channel and forming an oxbow lake or billabong. Rivers that carry large amounts of sediment may develop conspicuous deltas at their mouths. Rivers whose mouths are in saline tidal waters may form estuaries. In certain languages, distinctions are made among rivers based on their stream order. In French, for example, rivers that run to the sea are called fleuve, while other rivers are called rivière. For example, in Canada, the Churchill River in Manitoba is called la rivière Churchill as it runs to Hudson Bay, but the Churchill River in Labrador is called le fleuve Churchill as it runs to the Atlantic Ocean. As most rivers in France are known by their names only without the word rivière or fleuve (e.g. la Seine, not le fleuve Seine, even though the Seine is classed as a fleuve), one of the most prominent rivers in the Francophonie commonly known as fleuve is le fleuve Saint-Laurent (the Saint Lawrence River). Since many fleuves are large and prominent, receiving many tributaries, the word is sometimes used to refer to certain large rivers that flow into other fleuves; however, even small streams that run to the sea are called fleuve (e.g. fleuve côtier, "coastal fleuve"). Rivers have been a source of food since pre-history. They are often a rich source of fish and other edible aquatic life, and are a major source of fresh water, which can be used for drinking and irrigation. Rivers help to determine the urban form of cities and neighbourhoods and their corridors often present opportunities for urban renewal through the development of foreshoreways such as river walks. Rivers also provide an easy means of disposing of waste water and, in much of the less developed world, other wastes. The coarse sediments, gravel, and sand, generated and moved by rivers are extensively used in construction. In parts of the world this can generate extensive new lake habitats as gravel pits re-fill with water. In other circumstances it can destabilise the river bed and the course of the river and cause severe damage to spawning fish populations which rely on stable gravel formations for egg laying. In upland rivers, rapids with whitewater or even waterfalls occur. Rapids are often used for recreation, such as whitewater kayaking. When the river is subject to vertical erosion, deepening the valley. Hydraulic action loosens and dislodges the rock. The rivers load further erodes its banks and the river bed. Over time, this will deepen the river bed and create steeper sides which are then weathered. The steepened nature of the banks causes the sides of the valley to move downslope causing the valley to become V-shaped. Waterfalls also form in the youthful river valley. Waterfalls usually form where a band of hard rock lies next to a layer of soft rock (easier to erode). Differential erosion occurs as the river can erode the soft rock easier than the hard rock, this leaves the hard rock more elevated and stands out from the river below. Hydraulic action and abrasion are what erodes the soft rock and the water to fall down to the river bed. A plunge pool forms at the bottom and deepens as a result of hydraulic action and abrasion. ^ "GNIS FAQ". United States Geological Survey. Retrieved 26 January 2012. ^ "WordNet Search: River". The Trustees of Princeton University. Retrieved 2 October 2009. ^ "Domestic Names: Frequently Asked Question (FAQs), #17". United States Geological Survey. Retrieved 2 October 2009. ^ Walther, John V. (15 February 2013). Earth's Natural Resources. Jones & Bartlett Publishers. ISBN 978-1-4496-3234-2. ^ Garde, R.J. (1995). History of fluvial hydraulics. New Age Publishers. p. 14. ISBN 978-81-224-0815-7. OCLC 34628134. ^ Garde, R.J. (1995). History of fluvial hydraulics. New Age Publishers. p. 19. ISBN 978-81-224-0815-7. OCLC 34628134. ^ "Sand River" in Iraq is actually a rapid movement of ice blocks. Tampabayreview.com. Retrieved on 14 July 2016. ^ Castree, Noel (2006). Questioning geography: fundamental debates. Wiley-Blackwell. pp. 84–85. ISBN 978-1-4051-0192-9. ^ Illies, J.; Botosaneanu, L. (1963). "Problémes et méthodes de la classification et de la zonation éologique des eaux courantes, considerées surtout du point de vue faunistique". Mitt. Int. Ver. Theor. Angew. Limnol. 12: 1–57. ^ Hawkes, H.A. (1975). River zonation and classification. River ecology. Blackwell. pp. 312–374. ^ "National Museum of Prehistory-The Peinan Site-Settlements of the Prehistoric Times". nmp.gov.tw. ^ "WWF – The World's Rivers". panda.org. ^ Meybeck, Michel (1993). "Riverine transport of atmospheric carbon: Sources, global typology and budget". Water, Air, & Soil Pollution. 70 (1–4): 443–463. Bibcode:1993WASP...70..443M. doi:10.1007/BF01105015. ^ Albrecht, Achim (2003). "Validating riverine transport and speciation models using nuclear reactor-derived radiocobalt". Journal of Environmental Radioactivity. 66 (3): 295–307. doi:10.1016/S0265-931X(02)00133-9. PMID 12600761. ^ Draper, Nick; Hodgson, Christopher (2008). Adventure Sport Physiology. John Wiley & Sons. ISBN 978-0-470-31913-0. ^ Cave, Cristi. "How a River Flows". Stream Biology and Ecology. Archived from the original on 1 January 2015. ^ Rosenberg, Matt (8 June 2006). "Do All Rivers Flow South?". About.com. ^ Rosenberg, Matt. "Rivers Flowing North: Rivers Only Flow Downhill; Rivers Do Not Prefer to Flow South". About.com. ^ Rydell, Nezette (16 March 1997). "Re: What determines the direction of river flow? Elevation, Topography, Gravity??". Earth Sciences. ^ "Landforms of the upper valley". www.coolgeography.co.uk. Retrieved 2 December 2016. Jeffrey W. Jacobs. "Rivers, Major World". Rivers, Major World – dam, sea, effects, important, largest, salt, types, system, source. Water Encyclopaedia. Luna B. Leopold (1994). A View of the River. Harvard University Press. ISBN 978-0-674-93732-1. OCLC 28889034. — a non-technical primer on the geomorphology and hydraulics of water. A levee, dike, dyke, embankment, floodbank or stopbank is an elongated naturally occurring ridge or artificially constructed fill or wall, which regulates water levels. It is usually earthen and often parallel to the course of a river in its floodplain or along low-lying coastlines. A floodplain or flood plain is an area of land adjacent to a stream or river which stretches from the banks of its channel to the base of the enclosing valley walls, and which experiences flooding during periods of high discharge. The soils usually consist of levees, silts, and sands deposited during floods. Levees are the heaviest materials and they are deposited first; silts and sands are finer materials. A braided river, or braided channel, consists of a network of river channels separated by small, often temporary, islands called braid bars or, in British usage, aits or eyots. Braided streams occur in rivers with low speed, low slope, and/or large sediment load. Braided channels are also typical of environments that dramatically decrease channel depth, and consequently channel velocity, such as river deltas, alluvial fans, and peneplains. The Kobuk River is a river located in the Arctic region of northwestern Alaska in the United States. It is approximately 280 miles (451 km) long. Draining a basin with an area of 12,300 square miles (32,000 km2), the Kobuk River is among the largest rivers in northwest Alaska with widths of up to 1500 feet and flow at a speed of 3–5 miles per hour in its lower and middle reaches. The average elevation for the Kobuk River Basin is 1,300 feet (400 m) above sea level, ranging from near sea level to 11,400 feet. Topography includes low, rolling mountains, plains and lowlands, moderately high rugged mountainous land, and some gently sloped plateaus and highlands. The river contains an exceptional population of sheefish, a large predatory whitefish within the salmon family, found throughout the Arctic that spawns in the river's upper reaches during the autumn. A portion of the vast Western Arctic Caribou Herd utilize the Kobuk river valley as winter range. A meander is one of a series of regular sinuous curves, bends, loops, turns, or windings in the channel of a river, stream, or other watercourse. It is produced by a stream or river swinging from side to side as it flows across its floodplain or shifts its channel within a valley. 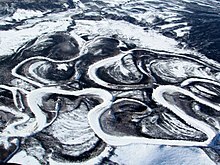 A meander is produced by a stream or river as it erodes the sediments comprising an outer, concave bank and deposits this and other sediment downstream on an inner, convex bank which is typically a point bar. The result of sediments being eroded from the outside concave bank and their deposition on an inside convex bank is the formation of a sinuous course as a channel migrates back and forth across the down-valley axis of a floodplain. The zone within which a meandering stream shifts its channel across either its floodplain or valley floor from time to time is known as a meander belt. It typically ranges from 15 to 18 times the width of the channel. Over time, meanders migrate downstream, sometimes in such a short time as to create civil engineering problems for local municipalities attempting to maintain stable roads and bridges. Stream load is a geologic term referring to the solid matter carried by a stream. Erosion and bed shear stress continually remove mineral material from the bed and banks of the stream channel, adding this material to the regular flow of water. The amount of solid load that a stream can carry, or stream capacity, is measured in metric tons per day, passing a given location. Stream capacity is dependent upon the stream’s velocity, the amount of water flow, and the gradation. 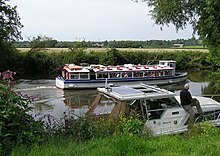 A bar in a river is an elevated region of sediment that has been deposited by the flow. Types of bars include mid-channel bars, point bars, and mouth bars. The locations of bars are determined by the geometry of the river and the flow through it. Bars reflect sediment supply conditions, and can show where sediment supply rate is greater than the transport capacity.